To distinguish Ted’s two 1999 Spec Miata race cars, he refers to them as the “2009 Build” and the “2010 Build” as each one was purchased and built in that year. Ted’s 2010 Build 1999 Spec Miata was purchased from Mike “Meathead” Collins in October of 2010 after the completion of the 2010 MARRS and National racing season. A picture of the car (larger photo) as it looked when Mike raced it in the 2010 SCCA National Championships is above right. Mike finished 20th out of 63 cars with this Spec Miata. This was Mike’s second 1999 Spec Miata built in 2010 as his first was lost in a high speed crash at the Watkins Glen National race. Mike won all three Labor Day races of MARRS 9 & MARRS 10 in 2010 and holds the second fastest lap at Summit Point with this car. 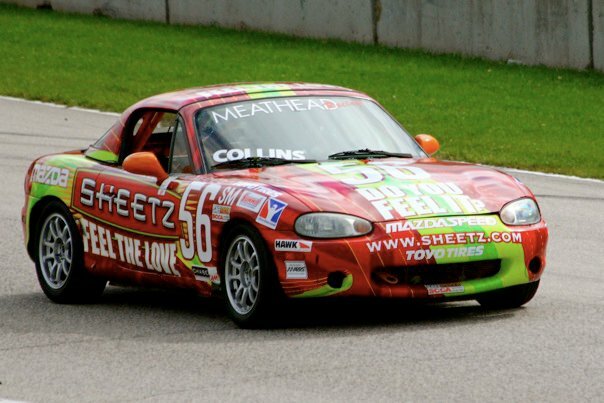 This car has a 1.8L Race Engineering motor and all of the other allowed features for a 1999 Spec Miata racing in the SM class for SCCA Club Racing. Ted had the car repainted for the 2011 racing season. The new paint job is shown here sans the Sheetz logos, etc and is the inverse paint colors of his ’09 build.